One of Scotland’s most iconic structures could be saved from ruin and transformed into a modern multi-purpose venue in plans unveiled today. 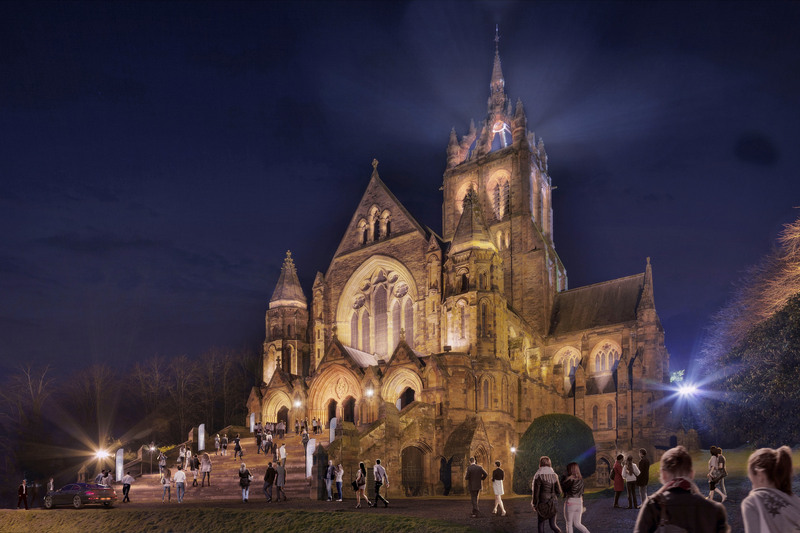 An official campaign launched to save Coats Memorial in Paisley will see a team of committed fundraisers aim to raise £1.5 million to breathe new life into the 125-year-old Gothic church in just 100 days. Plans for Coats Memorial include the construction of a single storey ticketing/booking office, landscaped gardens, a car park with space for 30 vehicles, a demountable performance stage, theatre seating for events and banquets, audio/visual rigs for specialist cinema evenings and a 400kg lift to provide disabled access between the church floor and ballroom. As part of the 100-day campaign, Coats Memorial has enlisted the talent of world-renowned tapestry artist Andrew Crummy who has begun a Tapestry of Paisley Icons, paying homage to the town’s most famous sons and daughters. 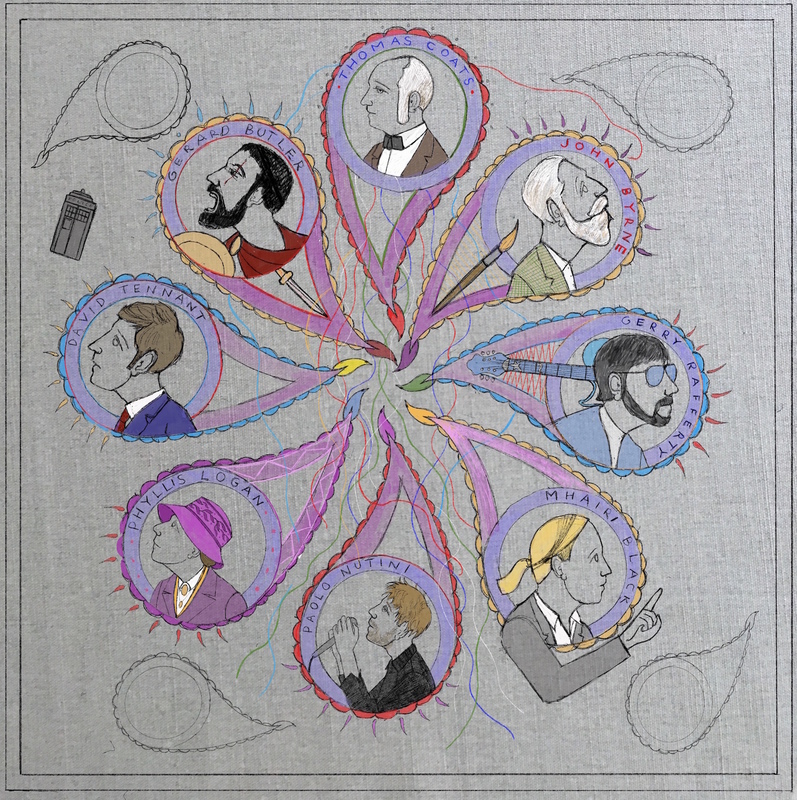 Featured on the bespoke tapestry is Thomas Coats, the original Paisley icon without whom Coats Memorial and many other public spaces and buildings in the town would not exist. Also immortalised in the artwork are; Gerry Rafferty; John Byrne; Gerard Butler; Paolo Nutini; Mhairi Black; Phyllis Logan and David Tennant. Ian Henderson, Coats Memorial Steering Group member, said: “On behalf of the Steering Group, I can say that we have been truly humbled by the support of people like Andrew and those involved in the Tapestry of Renfrewshire for lending their talents to our community campaign. “We hope this bespoke piece of artwork will attract thousands of visitors to Coats Memorial during the 100 days so that they can stitch a piece of history. Who knows, perhaps even some of our Paisley Icons will even make an appearance themselves. The Tapestry of Renfrewshire was created in support of Paisley’s bid to become City of Culture 2021. Sadly, the bid was unsuccessful which saw the Tapestry without a home. Now, as part of the 100 Days to Save Coats Memorial campaign, the Tapestry lives on. Andrew Crummy said: “We are thrilled that this will be the home of the tapestry. We believe it is the perfect fit. The Tapestry is being stitched using over 8000 donations of Anchor Threads that have been given by hundreds of local people. Throughout the 100 days campaign Coats Memorial will also host performances by Paisley Opera, PACE Theatre Company, Royal Conservatoire of Scotland and University of West Scotland Choir, with many more to be confirmed. Coats Memorial will be open to the public every Saturday from 12pm until 4pm for the duration of the campaign. To fundraise or donate visit here.